How does the government seek to support the Destitute and Obscure? Well, I signed my lil’ ol’ self up for the WIC (that would be Women, Infants and Children) program, with all my documentation in tow—sonograms, blood tests, power bill, passports, proof of (lack) of income and first-born child. As a WIC participant, both my child and I receive checks that I can use at the local Safeway to buy certain wholesome foods. At least that is the general idea. In practice, however, the selection options aren’t that good. I get $17 total for the two of us to buy produce, and I buy organic, so that gets me a red pepper, an avocado and about two separate weeks worth of bananas. We eat A LOT more produce than that. The only other option I have to buy organic is tofu, which I do, and we get two blocks per month, which takes care of two meals for my family. I have options to buy juice, bread, lots of cereal, dry beans or lentils, peanut butter, canned fish, milk and eggs. And one block of cheese per month. None of these options can be organic, which translates to the following: bread made with high-fructose corn syrup (um, really?! In bread?) cereal that can contain high amounts of sugar, dried beans that are too time-consuming for me to use (okay, that’s pretty much my own thing) peanut butter that will contain sugar and/or high fructose corn syrup unless I get the ‘natural’ variety, which I do, and dairy that is loaded with hormones, antibiotics and heaven only knows what else. The juice is sugar regardless, so sometimes I buy it and sometimes not, but they allow for the two of us to get up to six 32 ounce bottles of it. So, in this review of items, the WIC program seems to be pro-sugar and supportive of lots of processed cereal. The inability to buy organic dairy is what irritates me the most, considering California’s Senator Diane Feinstien has introduced legislation that would ban the use of subtherapeutic (and already intensive) use of antibiotics in the dairy, egg and meat industry. It seems that a state-run program should follow support this legislation, but no. It’s the politicians (at the state, not national level) who make the rules (not the mothers, children or WIC nutritionists) about what I can or cannot buy with these checks. It seems like a great idea—to offer low-income moms and kids free food— and for some, it may improve their nutrition and the ability to provide for their families, but it doesn’t go the extra mile. Maybe more like an extra inch or two. I don’t get the eggs, bread or milk… oh well. 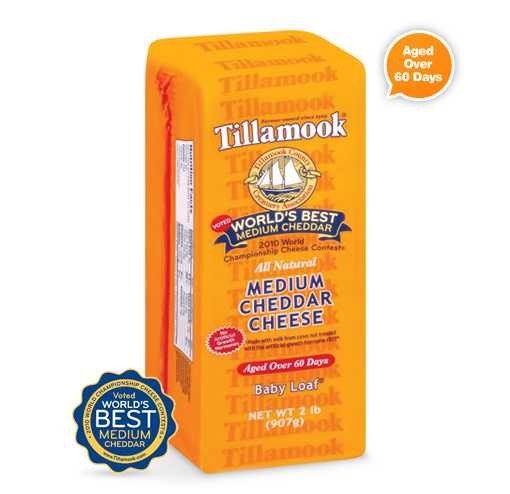 Since I can’t get organic cheese, I buy Tillamook, which is rBGH (recumbent bovine growth hormone) free and uses vegetable rennet. This takes most of the hormones out of my cheese, and it’s yummy… and I wish I was allowed to get more. I get canned salmon and make salmonloaf with it—yummy and cheap. Recipe to follow. I buy Cheerios (the plain kind) and while they aren’t as good as the Whole Foods brand, both my kid and I eat them—with organic milk bought somewhere else. I buy the ‘natural’ peanut butter—Adams, and Laura Scudders both make a version I can purchase. I buy the frozen orange juice and have it when I need it. I use my produce check mostly on bananas, which I realize aren’t particularly environmentally sound, but they aren’t local regardless of where I shop. The organic produce at my Safeway is a bit sub-par and never local. It may save us a little bit of money, maybe $20 a month, which is something, but when I factor in the fact that I have to drive 20 minutes to the WIC office and spend a couple hours of my time per month to save the money, I begin to wonder if it’s really worth it. The hours spent at the local WIC office aren’t just waiting for the slow, overburdened grind of a government agency to process my checks. In addition to showing proof of my pregnancy (do think I swallowed a basketball?) and my health, I have to attend short classes about baby care. Perhaps I am being a bit snobbish, but um, I know what it means when a baby cries. I know how to breastfeed. I’ve done my own research, I read at least 50% of what’s been written on the subject by experts and non-experts alike and not least of all worth noting— I’ve done this baby-thing before. I already have a child. But I suppose they have to cover every possible range of informed or uninformed mom, and I try my best to check my attitude at the door. I try, really, but I pride myself on being well-read, and I don’t like to be herded into the shallow end of the informed. The WIC program, like any other government-sponsored program does the best it can with the funding it’s got—which is never much—and progresses at the snail-pace of legislation. It’s come a long way over the years, but it’s still woefully behind in terms of nutrition. With all the recent journalism and research about processed food and nutrition moving at a dizzying pace, WIC is getting left in the dust. I appreciate the help, believe me I do, but my first consideration is the health of my family and that of the environment, second being saving a few bucks. I’ll save another way, not at the expense of our long-term health. I don’t know if my dear grandmother made this recipe up, or whether it comes from one of those curious 1950’s cookbooks, or even further back to the war-time cookbooks with all the meat alternatives. In any case, it was passed down to my mother, and she taught me how to make it once I had a family of my own. It’s cheap and easy, delicious and nutritious, and like meatloaf, you can put it in a sandwich the next day for lunch. You can garnish it with a bit of lemon juice, but we use ketchup or tartar sauce in my house. Start with the fun part: smash the Saltines in a plastic bag. Smash ‘em to smithereens—nice pea-sized crumbs, not dust. 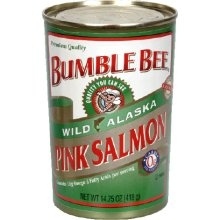 Open the can of salmon, pour the liquid into a measuring cup and set aside. Then move on to the nitty-gritty part, which is dumping the contents of the can of salmon into a bowl and going through and meticulously removing all the skin and most of the big bones. Messy work, but it all the skin and bones down the garbage disposal. It’s okay to leave a few of the little bones, as they’re already cooked down and they’ll cook down even further when you put it together and bake it. Plus, you get a bit of added calcium. My mother nibbles on them while she prepares the recipe, but I’m not quite that bold. Now, with cleaned hands, add just enough milk to your reserved salmon juice to make ½ cup of liquid. Note: any milk substitute will work here if you don’t do cow’s milk. Add the egg to the liquid and mix it all up, then add to the salmon. I mix it with my hands, because I’ve already gooped them up once, so why not do it again? When the liquid and the salmon are mixed together evenly, and all the fish chunks are broken up, add the crushed crackers and mix those in—again, I use my hands. Press the whole mixture to a greased (I use olive oil) loaf pan and bake at 350 degrees for about 20 minutes, or until the top is vaguely browned. Hey Alison. Don’t give up on beans–they’re super healthy, cheap and filling. I do mine (black or garbanzo) in a crock pot over night. Sort and rinse the beans, use a generous amount of water, a big chunck of onion, clove or two of garlic, and salt (they say the beans won’t get soft if you add it from the beginning, but I’ve not had that problem). Set it on low, and in the morning, yum. Julie! You give me new inspiration to buy a crock pot. Could totally swing the black beans. Thanks! The government should not be paying for your food. and hopefully we’ll all come to realize that the government actually pays for everyone’s food. Thanks for chiming in. Thanks for the salmonloaf recipe! It sounds delicious.